Business and Creativity: Yes we can! 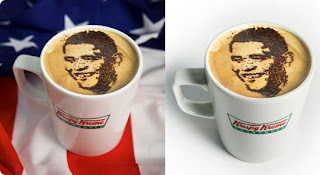 It turns out Obama himself gave the American economy a boost when his face became the most popular print on t-shirts, buttons and mugs. When someone becomes a pop icon, they tip a point when everything they touch becomes gold. Most band managers and labels know that there is a lot of money to be made from merchandise if you can become an icon. If it becomes cool to have your face on someone's t-shirt you can probably make more money with merch than you can with selling music (digital, cd and live). But if the point tips too much, then you run the risk of becoming a cheesy icon (let's think Boy George) or other people will start making money from your 'iconicness' and you start losing money. bands don't own their image anymore (managers, label execs, stylists will try and 'tailor' your looks so that you are more marketable) Has anyone seen Lady Gaga lately? I wonder what she looks like first thing in the morning. So what do bands own? Well if they are smart, they will keep a hold of their IP. Bands/musicians/songwriters only own their creativity. The only thing they have that is unique is their thought process and their ideas. If they don't protect that, they are nothing more than a product on a shelf.